Posted on July 9, 2018 by Andy Higgs in Africa, Features, Places. Elephants are among Africa’s five most iconic animals, popularly referred to as ‘The Big Five’. For all African safari adventure goers, seeing an elephant in its natural habitat is an undoubted must- see but where are the best places to spot them? From Botswana to Namibia, we take you through the best destinations for seeing elephants in Africa. With over 100,000 elephants at Chobe National Park and Okavango Delta, there are plenty opportunities for elephant sightings in Botswana. The Okavango Delta offers the rare sight of elephants crossing water channels in an environment that’s not commonly found in other African Safari regions. Chobe National Park provides excellent elephant viewing if you want to witness large numbers, as does Linyanti Wildlife Reserve, which is probably a better private safari option than Chobe. A Zimbabwe safari offers the ultimate in elephant viewing. The elephant sightings are excellent at Hwange National Park in the drier winter months of June – October when vast herds of elephants gather around waterholes. Another fantastic location is Mana Pools National Park with the Zambezi River serving as a captivating background. A Tanzania safari is guaranteed to yield excellent elephant sightings, especially the Southern wildlife regions of Selous Game Reserve and Ruaha National park. These two fantastic wildlife areas offer spectacular viewing between the drier months of June and October and you can find excellent deals for travel during that period from safari holiday experts like tanzaniaodyssey.com. At Tarangire National park in the Northern part of the country, vast herds of elephants migrate from June to the Park and this provides an exceptional elephant viewing opportunity too. Of course, no guide would be complete without a nod to the Serengeti, another ideal location for spotting elephants. A South Africa safari offers excellent elephant sighting experiences at Kruger National Park and Madikwe Game Reserve. 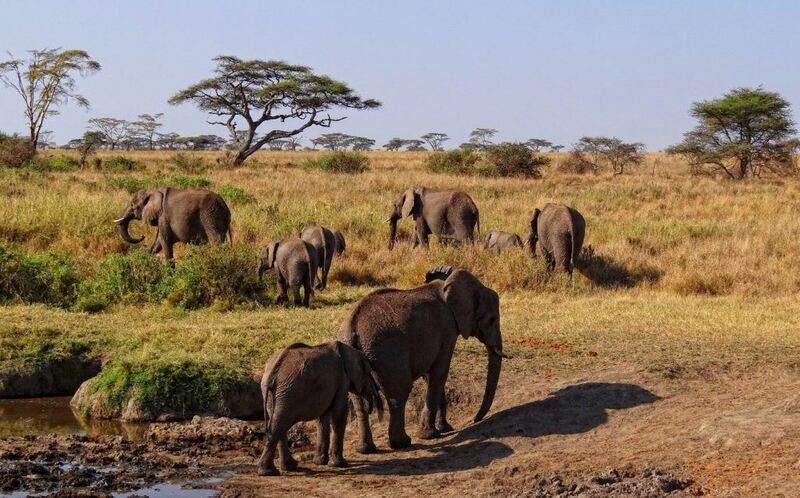 Another great destination to see elephants in Africa is at Kenya’s famous safari parks: Amboseli National Park, Samburu, Tsavo and the Masai Mara. Sightings of elephants that have adapted to the desert are rare, but that’s the experience on offer in Nambia at Damaraland and Etosha National Park.